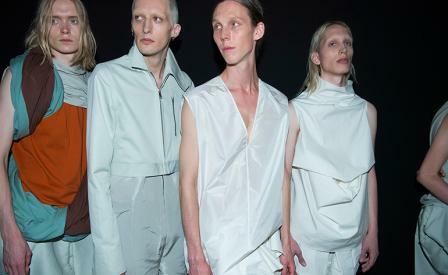 Mood board: Entitled ‘Walrus’, Rick Owens’ S/S 2017 collection was an evolution of the artisanal Armageddon he showed last season. Presented in the cavernous cement basement of the Palais de Tokyo to the spare sound of Neil Young’s 1970 ecological doom poem ‘After The Gold Rush’, the clothes were gentle, despite their exaggerated volumes and complicated draping. Owens explored the technicality of drape in numerous ways, proposing new silhouettes in menswear. T-shirts and shifts were twisted and slung around the body, creating a furrowed line similar to muscles and tendons in medical drawings. Best in show: Jackets were cropped with lengthened sleeves to alter posture and lift the torso upwards. Owens’ signature black leather jackets were tight to the ribcage, worn over jumbo coveralls that swirled and stretched right down deep into the ground. Going from off-white to rust, gold and then black, the collection of cocooning and transformative clothes swung between crisp, washed silk gazars and sturdy industrial cottons. Finishing touches: S/S 2017 marks the latest in Owens’ ongoing collaboration with Adidas, which has satiated sneakerheads and street-style stars since its inception in 2014. The upper of the new ‘Level Runner’ (which was hidden for most of the show underneath the exaggerated hems of the trousers) has been refined in the designer’s quest to create the sleekest performance running shoe possible.